Florida Researchers have developed a new class of LEDs that may change the lighting and display industry of the future. Florida State University’s Hanwei Gao, an Assistant Professor of Physics and Biwu Ma, an Associate Professor of Chemical Engineering have already published their results in Advanced Materials, and their study has been well received. They basically used organometal halide perovskites: a type of material also used in some solar panels, which has a number of remarkable properties. In fact, perovskites have been hailed by many as potentially revolutionary for LEDs, but so far, a number of experiments have failed to obtain the desired efficiency. But Gao and Ma pushed on, firmly believing in the material’s ability to deliver. They used the synergy of synthetic chemistry and device engineering to tweak the material properties, ultimately engineering the device architecture just as they wanted. The results are impressive. Not only is it much brighter, but it’s also cheap and fairly easy to make. To put “brighter” in perspective, LEDs like those in your computer emit approximately 400 candelas per square meter – the candela is the measure unit for luminous intensity; these new LEDs go out at 10,000 candelas per square meter. Interestingly, this increase in luminosity doesn’t make things more expensive. 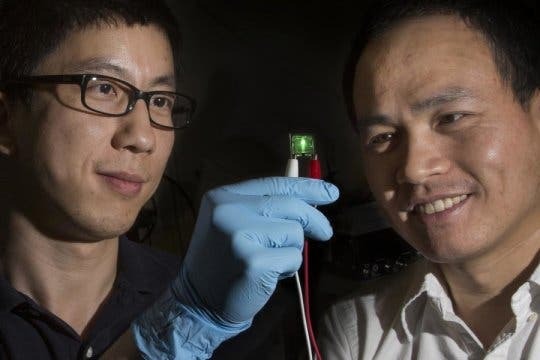 In fact, the improved perovskites that the duo designed are more stable than standard hybrid perovskites in humid air, and this means that the production is not only cheaper, but also faster: it only takes about an hour to produce the material. LED technologies are very important for reducing electricity consumption, with the U.S. Department of Energy asserting that LED lighting uses at least 75% less energy than regular incandescent lighting. However, while LEDs are more efficient, their implementation for general lighting has generally been slow, and there are many concerns about this sluggishness. Developing better materials and even better LEDs could speed up that process, but it could do even more than that: the display of most computers, laptops and smartphones uses LEDs, and again, new technology could not only decrease consumption, but also increase user experience. Journal Reference: Bright Light-Emitting Diodes Based on Organometal Halide Perovskite Nanoplatelets.